China’s birth rate trend, paired with recent wage increases across the nation, has heightened competition among companies looking to hire. For foreign companies, effective employer branding within China is increasingly crucial as the labor supply diminishes. China’s internet penetration rate has increased rapidly over the past decade, hitting 47.9 percent of the population in 2014 (compared to a mere nine percent in 2005). As a result, employers and employees in China have transitioned to online hiring platforms as a medium of communication. The majority on international companies use LinkedIn as the primary portal to contact potential employees. Unlike Facebook or Google, access to LinkedIn is unrestricted in China, and thus appealing for international and domestic companies alike. Until recently, LinkedIn did not offer a Chinese desktop version, and only users with competent English language skills were able to navigate the site. Even with this restriction, a total of four million Chinese nationals owned LinkedIn accounts in 2014, and this number is expected to skyrocket as the website is now available fully in Chinese. For foreign companies hoping to use domestic websites to locate staff, WeChat (a popular social media platform), Ganji, Zhaopin and 51job dominate the local job hunting market with over 717 million total registered accounts. In the past, foreign companies’ connectedness with the global market was a strong pull factor for attracting Chinese employees. However, as Chinese companies themselves increasingly internationalized their business scopes, the appeal of a foreign employer has diminished. In 2013, 38 percent of Chinese graduates hoped to find a job with an international company; the percentage dropped to just 21 percent in 2014. China’s 2014 university graduates report high salary and opportunities to advance as the two most important career traits, followed by high future earnings, clear advancement path, and professional training and development. On the other hand, western employees report employer culture and interpersonal relations as the primary determinants of occupational attractiveness. In China, state-owned enterprises are also often viewed as more attractive career choices than multinational corporations, as government jobs provide strong financial stability and secure benefits. In terms of salary, China’s work force is accustomed to a portion of income distributed as benefits and allowances. Employee meals are subsidized by 55 percent of Chinese companies, and approximately 47 percent of businesses offer allowances for housing and transportation. Wages in China have increased across all sectors in the past few years. In 2014, half of all Chinese workers received wage increases of six to ten percent, and 70 percent of current employees in China expect additional wage increases within the next year. Foreign companies should anticipate these expectations, particularly in China’s service, automobile, and construction industries, which have witnessed strong growth in wages. White collar workers across all sectors enjoyed an eight percent salary increase, with salaries in automobile manufacturing companies seeing an 8.3 percent growth over 2014. In the same year, executive and managerial pay grew by 7.9 and 8.1 percent respectively. While the top tier cities of Shanghai, Beijing, and Guangzhou had previously attracted scores of Chinese graduates tempted by the cities’ high wages and prestigious employment opportunities, China’s second and third tier cities have begun to appeal to a larger share of China’s work force. Roughly 32 percent of China’s graduating work force in 2014 indicated a preference for China’s rapidly developing second or third tier cities such as Wuhan or Dalian, as economic and occupational opportunities are not paired with the stiff competition found in China’s tier one coastal cities. China’s second and third tier cities have also attracted the attention of foreign investors in recent years. Improved infrastructure and transportation has allowed foreign companies within these cities to provide goods and services to tier one markets while remaining competitive in developing and less expensive locations. 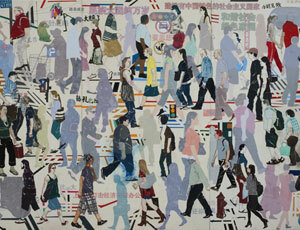 China’s workforce is experiencing a shift in occupational preference as well as location. China’s manufacturing and construction industries lead the market for multiple years, but may soon by surpassed by the service industry. In 2014, China’s service industry experienced an 8.1 percent growth rate, outpacing national GDP growth. Within two years, jobs in the service sector are expected to grow faster than in other sectors. With China’s 2015 Revision of the Catalogue of Industries for Guiding Foreign Investment, service sectors such as health care, transportation, and telecommunication have been expanded to allow for greater foreign investment, reflecting this structural shift in the Chinese economy. The turnover rate of employees in China is significantly higher than other nations. In 2013, 35 percent of Chinese staff employed at international companies had changed jobs in the past two to four years, and 10.4 percent of employees had found a new job within the previous year. Only 25 percent of China’s 2014 undergraduates expected to remain employed at their first job for more than five years, with 58 percent predicting their first job would only last two to three years. The growing demand for employees explains these recent trends, as Chinese employees unsatisfied in their work incur lower risks searching for a new job than in other nations with higher unemployment rates. Foreign companies must take care to effectively market not only to consumers, but employees as well. As domestic companies continue to win the preference of Chinese workers, effective employer branding becomes increasingly critical for foreign enterprises looking to attract the best and most qualified Chinese staff. 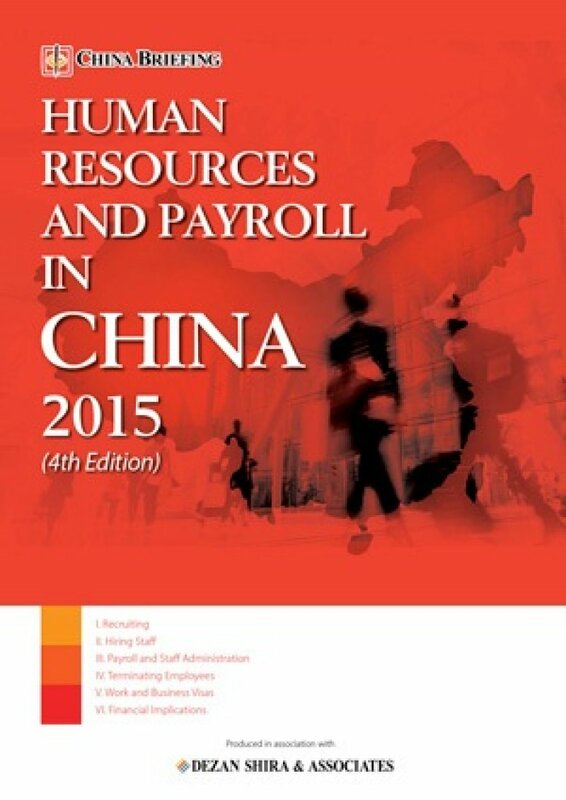 This edition of Human Resources and Payroll in China, updated for 2015, provides a firm understanding of China’s laws and regulations related to human resources and payroll management – essential information for foreign investors looking to establish or already running a foreign-invested entity in China, local managers, and HR professionals needing to explain complex points of China’s labor policies. In this issue of China Briefing magazine, we explore the options that are available to foreign firms looking to restructure or close their operations in China. We begin with an overview of what restructuring an unprofitable business in China might entail, and then take an in-depth look at the way in which a foreign company can go about the restructuring process. 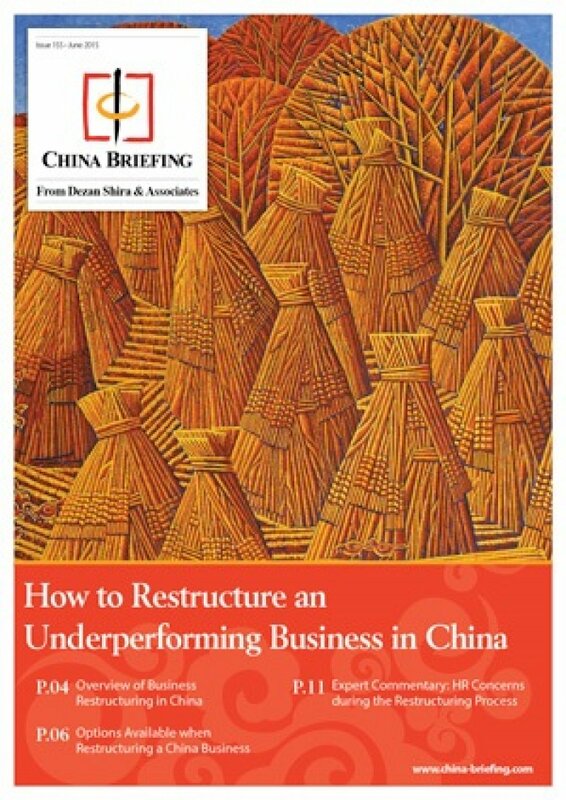 Finally, we highlight some of the key HR concerns associated with restructuring a China business. 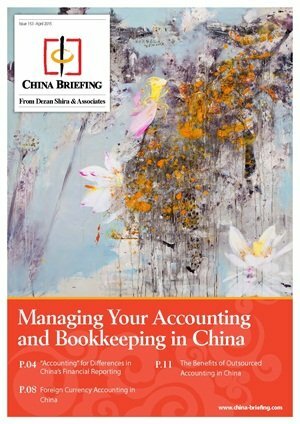 In this issue of China Briefing, we discuss the difference between the International Financial Reporting Standards, and the accounting standards mandated by China’s Ministry of Finance. We also pay special attention to the role of foreign currency in accounting, both in remitting funds, and conversion. In an interview with Jenny Liao, Dezan Shira & Associates’ Senior Manager of Corporate Accounting Services in Shanghai, we outline some of the pros and cons of outsourcing one’s accounting function.